It is a fact that Kraków likes Spanish culture. Its food, its people, its traditions, its language. If you disagree, you must only go to take a quick look at Mówimy po Hizspańsku meetings. 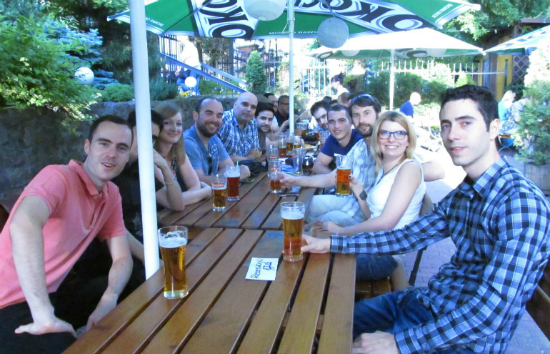 Six months ago, a group of Spaniards working in Kraków decided to organise weekly gatherings. Every Friday after work, these Iberians arranged to meet in a bar to have a drink and chat. But, what they wanted was local people to join them and extend the circle of friends. Living in Poland, they must take advantage of the country and interact with non-Spanish. That’s the reason why everyone who is interested on improving their Spanish language skills, learning about its culture or simply enjoying its people is more than welcome. Nowadays, about 60 people attend the events, sometimes over a hundred participants. And the organisers achieved their goal: those who attend aren’t only Spanish, but Polish, Latin American, Portuguese… even English or Dutch. The group is growing in number and extending their range of activities since the attendees are the ones who ask for more and more. As a result, at the end of September, they participated in a food market to promote a typical Spanish dish: Tortilla de patatas. The party was such a great success that will likely become a regular tradition. Apart from the cooking events, called Jemy po Hiszpańsku, they have already organized concerts, known as Spiewamy po Hiszpańsku. Besides, they are going to open a cultural area Populariszujemy po Hiszpańsku where they will do some speeches two Thursdays per month. The first conference is going to be on November 6 in the bar Bonobo Księgarnia Kawiarnia Podróżnica (Mały Rynek 4). They are also planning to launch a website, but the project is still unfinished because all of them are volunteers and they must work from Monday to Friday. 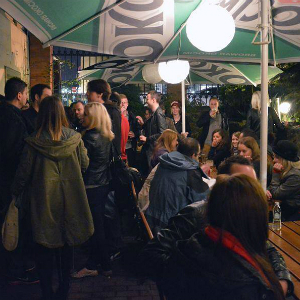 The weekly meetings used to be located in the bar Palce Lizać (Topolowa street, 3), but for winter they are looking for a warmer place. You can find more info about them and the next gatherings in their Facebook page and also enjoy some videos in their Youtube channel. On Friday September 10, reporter Esmeralda González with the Kraków Post TV went along to get to know how these Spaniards enjoy and spread their culture in Poland. Ready for learning some Spanish and having fun?